Siloso beach is located in Sentosa Islands of Singapore. Siloso Beach along with Palawan Beach and Tanjong Beach are beach attractions in Sentosa Islands. 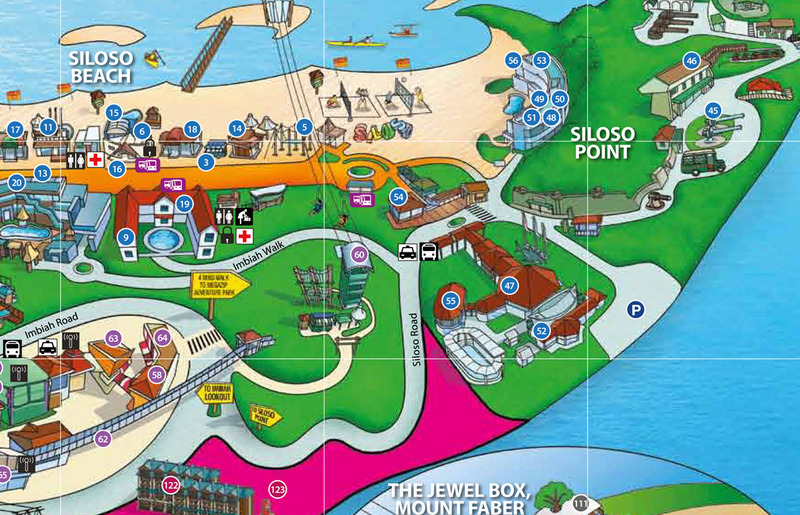 When you read Siloso beach map you can see there are many tourist attractions around Siloso beach. There are many ways of transportation's to Siloso Beach from the entrance of Sentosa islands, Harbourfront. There are public buses, beach tram or car park that stop in station along Siloso beach. There are also place to stay the night at Siloso beach like Shangri-La’s Rasa Sentosa Resort and Siloso Beach Resort. Tourist attractions that Siloso beach has are variety, from water sport to delicious restaurant. 1. Siloso Beach. White sands beach that perfect to sun bathing, volley ball or just take lazy stroll. Do not forget to take selfie in front of Siloso mark structure. 2. Wings of the Time. The Wings of the Time is night show in Siloso beach which are combine display of water jets, laser show and also fire effects, with majestic music and open sea panorama as a background. 3. Sentosa Luge & Skyride. Luge is a kind of ride that has unique steering and braking systems. There are two luge trails to cruise in Siloso beach. Dragon trail with 688 metres long and Jungle trails with 628 metres long. Skyride offers you a breathtaking view of Sentosa islands, main island of Singapore and South Cina Sea from up above. 4. Azzura Beach Club. For tourist that wants to experience the fun of night club along the beach or just enjoys delicious food and coffee. 5. Wave House Sentosa. Wave House is the venue that was designed like California beach style. People who are not try surfing before, could try its adrenaline wave rider. Double FlowRider and 10 foot FlowBarrel. This place is famous to young people. 6. Megazip Adventure Park. Megazip is the attractions that give participants a chance to roll down along the zip line from the peak of Imbiah Hills to man-made islands of Siloso beach. The “zipper” has a speed 60 km/hour across the jungle, beach and the sea. 7. The Flying Trapeze. This is a sport attraction for learning trapeze. Participants are flying by trapeze up above the beach. 8. iFly Singapore. The indoor place that gives a chance to skydiving just like true fall experience. 9. Underwater World Singapore and Dolphin Lagoon. It is perfect for family vacation. People could meet marine animals and experience feeding the animals. Enjoy long walk under the sea in 83m tunnel. There are some attractions that you could see in Siloso beach map that worth to try if you visit Sentosa islands.